Piano Sheet Music for Beginners "Snakes": Free! Piano Sheet Music for Beginners "Snakes"
"Snakes" piano sheet music for beginners makes reading notes easier by focusing on just one question: which way does the note go? It can only go up, down, or stay the same. And it doesn't matter where they start! "Snakes" is the next step after Wormies, another piece of free kids' sheet music. Pick any key on the piano to be the starting note, use only your pointer finger, and you're off to the races! Make it easy - just one problem at a time! This piano sheet music for beginners helps by focusing on just one question: which way does the note go? With no clef sign or time signature to muddy the waters, students only need ponder, "Line note? Space note? Moving up -- or down? Or the same!" Kids like a challenge that calls on a single skill. No finger numbers to worry about -- just use the pointer finger. (Although I have found that most kids WANT to try to play Snakes and Wormies using all five fingers!) And you can pick any key to be the starting note! So this is an easy exercise to get perfect. It makes them feel smart, and tells me instantly if there's comprehension in their note-reading. Writing big fat notes (an exercise we do frequently as part of learning to read notes) on a whiteboard is one thing -- somehow the notes don't look the same printed small on a page. For young kids, I might assign just #1 the first week, to be played 2x a day. Next week, #2. Very often, the kids will go ahead on their own, because they find this piano sheet music for beginners so easy. Don't let them memorize it! When I ask for solos in a group setting of new beginners, kids frequently wish to play a Snake. The other kids and I will follow along (keeping their attention from wandering) by calling out, "Start," (that's what we call the first note, as this is an exercise only about reading steps and not real staff notes), "up - up - up - down, up -" etc. When kids have mastered these exercises, they are usually ready to go on to "Snakes Go for a Walk," which introduces skips into the mix. The skips are "hidden" -- that is, I don't tell them where they are. It can be surprisingly hard to spot them for beginners, so I start it slow; #1 has 1 hidden skip, #2 has 2 hidden skips, etc. I hope your students enjoy this piano sheet music for beginners! Black Keys songs - a whole page of songs set to lyrics and poems, all on black keys! C&B & C&D - Left hand, then right hand, play little songs with lyrics that make them fool-proof. Dueling C's - a short song with 3 notes: B, Middle C, & D. The thumbs of each hand are "fighting" for the Middle C - but the music makes it plain which hand really owns it. Fuzzy Wuzzy - this song is about a bear that WASN'T fuzzy. Quarter rests form part of the action! One-handed & two-handed arrangements. Indian Dance - Though it sounds powerful (and even difficult with an added repetitive chord in left hand), it is very intuitive and repetitious, easily conquered in several lessons. Jingle Bells - Is there a child who doesn't know this happy tune? Its repeated notes make up for the "tricky" skips in the melody - plus there are lettered notes in some of the arrangments! Lavender's Blue - this pretty song forms part of the drama of Cinderella's rescue by the prince in the newest Cinderella movie with Lily James... little girls love to play this song! Mary Had a Little Lamb on the white keys - even adults benefit from having this tune "in hand" - later they will learn much about using chords from simple little songs like this. Music Alphabet Song - from A,B, & C in the left hand, through C, D, E, F, & G in the right hand, this song travels scale-wise through all the notes, to help a logical thinker conquer this concept. Ode to Joy - like Mary Had a Little Lamb and Jingle Bells, this melody is well-known, and starts with finger 3 on E.
Peck! Peck! Peck! - a "shared-hands" melody, this cute song about chickens pecking on the ground to find their breakfast only moves by steps. Pizza Please - Using just 3 notes, this song for left hand or right hand is actually Hot Cross Buns in disguise. Sharks - Wait until kids have started working on the treble and bass clef with this dramatic 3-note song. Snakes Go for a Walk - More exercises like Wormies and Snakes, but with "skips" hiding amongst the steps in each line. Line 1 has one hidden skip; line 2 has 2 hidden skips - you get the idea! Twinkle, Twinkle, Little Star - this song is so familiar that children will conquer it easily, especially because it moves by repeated steps. Excellent for memorizing and transposing. Wormies - This little set of exercises asks beginners to choose ANY white key, and then decide whether to move up, down, or stay there, by looking at the next note. EASY. You are awesome. Thank you. I'm a voice and piano teacher and to have so many pieces in one place- for many different levels- is a Godsend. 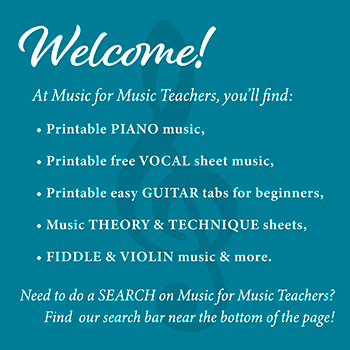 Thank you for the time and effort you have put in to make this so easily available to all of us stressed music teachers!!! THANK YOU! THANK YOU! THANK YOU! Your hard work helped me in my college Introduction To Music class. As a 50++ student, I struggle remembering all the chords, triads, inversions, etc... Without this amazing wealth of info, I would fail. What a blessing!